Unapologetically Female: "Grossly Obese" Cat is Surprisingly Healthy! 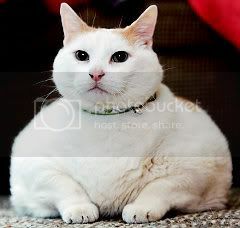 Well, actually, the 44-pound cat's original owner named him Powder, but when she had to give him to an animal shelter after the foreclosure of her home, someone (in either the shelter or the media) decided to re-name him Chunk. Delightful. This story is just bursting with class issues. There's something so heartbreaking about Donna Oklanter losing her house, having to put her husband in a retirement home, moving in with friends, and having to watch the cat she gave up appear on Regis and Kelly and Good Morning America accompanied by a "foster" parent from the shelter. I'm about to get to the Fat Acceptance part, but I'm going to put in my two cents and say that if Powder's new owners really had hearts, they would get in touch with Donna Oklanter and let her know she can have her cat back as soon as she is ready for him and that she can visit him anytime she wants. Powder/Prince Chunk/Whatever-You-Want-to-Call-Him is in the news because of his size, which is apparently a couple of pounds shy of the world record weight for a tabby. And, obviously, since the world thinks that FAT = UNHEALTHY, the coverage is filled with concerns about his health. His original owner suspected a thyroid condition, and one article speculated about how his new owners may be burdened with giving him insulin shots if he's diabetic. After a complete health inspection, however, SURPRISE! The cat is completely healthy. Apparently, no one involved in this entire story has ever heard of Health at Every Size. Despite his perfect health, he's been put on a diet and an exercise regimen to make him lose weight. Because losing weight is the most important thing ever. Even for cats. Don't get me wrong, I adore Powder as much as the other fans. In fact I have part time custody of a Powder lookalike feline called Johnny Anderson Diamond. But, I too was deeply concerned about the lack of public interest in his previous owner's reduced circumstances after losing her home. Powder though traumatized, will eventually adapt to his new family and his upper class home. But what about Donna, a 65 year old woman without a home and a family, surviving only on the goodwill on another. Has our compassion dried up? Forgot to mention the public's lack of interest in adopting the other strays at the shelter. Seems as if hundreds of folks wanted the "celebrity" Powder while the others like Pebbles remained homeless with the shadow of euthanasia hanging over them. Maybe Powder's purpose was to draw attention to the overcrowded and under-funded shelters. Come on people - adopt a stray and do something selfless for once in your life. I know. The whole story is full of these issues that are just lurking beneath the surface of the "fluffy" news story about this unique cat. If you look at the comments to those articles, lots of people are concerned about his original owner and about the number of homeless animals in shelters. I noticed how he held his head showed that he had the muscle to match the weight.